Uploading Filters. How to include or exclude files and folders to/from uploading. File filters for Amazon S3. Uploading Filters. How to include or exclude files and folders to/from uploading. By default S3 Browser uploads all files and folders to Amazon S3. Uploading filters allow you to include or exclude some particular files and folders to/from uploading. This could be useful if you would like to backup just some particular types of files, for example images, documents, video files, etc. 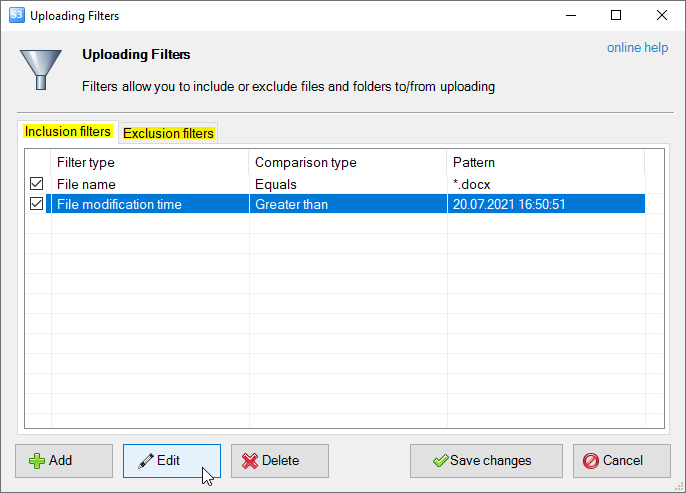 Using uploading filters you can also exclude some files or folders from uploading, for example system or hidden files, temporary files, too large files or files created after specific date. 3. 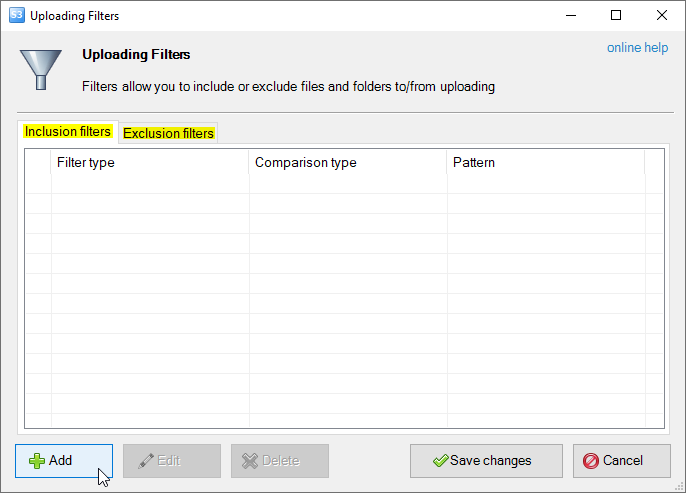 Choose the kind of filter you want to add: Inclusion filters - to upload just some particular files or Exclusion filters - to exclude some files from uploading. 5. Specify Filter type, Comparison type and filter details and click Add new filter. File name filter allows you to include or exclude files and folders to/from uploading based on their name (path). Wildcard characters are supported. File name is case insensitive. 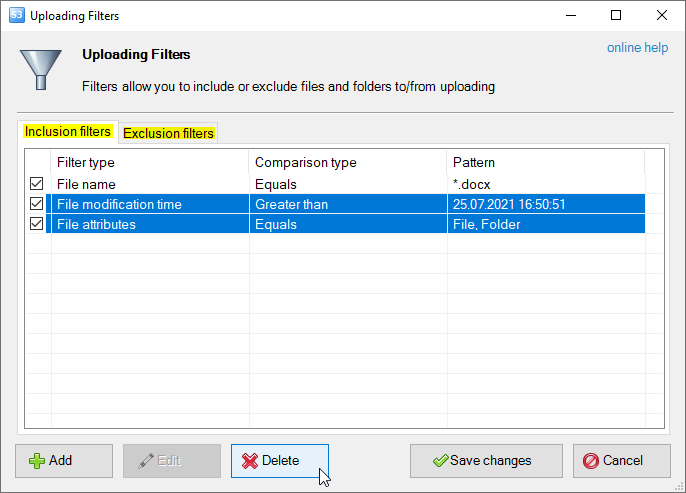 File size filter allows you to include or exclude files to/from uploading based on their size. You can specify file size in bytes, kilobytes, megabytes, gigabytes, terabytes. File attributes filter allows you to include or exclude files and folders to/from uploading based on their attributes. You can specify the following attributes: File, Folder, ReadOnly, Hidden, System, Archive, Compressed, Encrypted. If you specify multiple attributes in one filter, file or folder will only match if they have all specified attributes (AND operator is used). 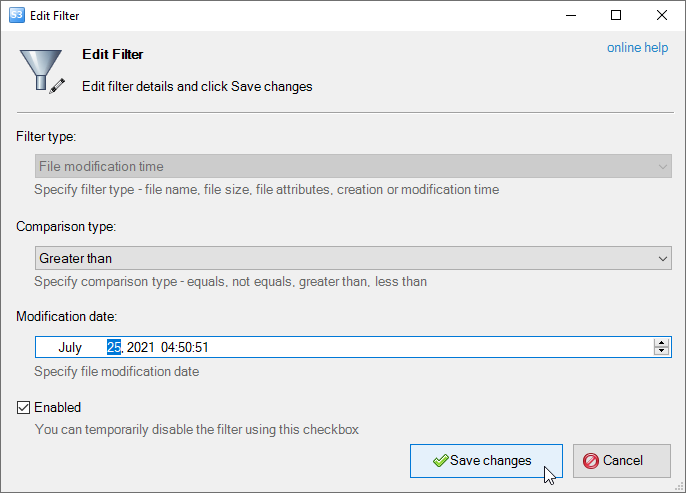 File creation date and file modification date filters allow you to include or exclude files and folders to/from uploading based on their creation or modification time. 3. 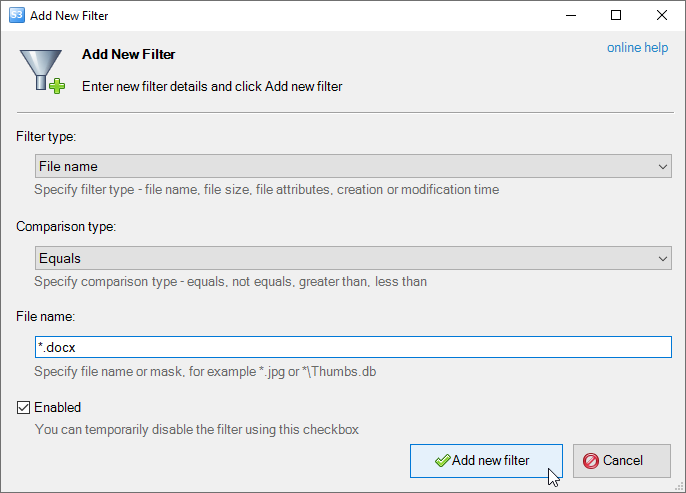 Choose the kind of filters you want to edit: Inclusion filters or Exclusion filters. 5. Edit filter details and click Save changes. 3. 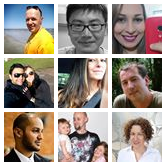 Choose the kind of filters you want to delete: Inclusion filters or Exclusion filters.